We loved having the 805 camera bus! This was such a highlight at our wedding! The team was so flexible and easy to work with. We customized many details for our Paradise themed wedding and they couldn't have been more accommodating. No wedding is complete without them! Recommending them is an understatement! Alycia, we appreciate you taking the time to write such a glowing review! Your wedding was absolutely stunning! 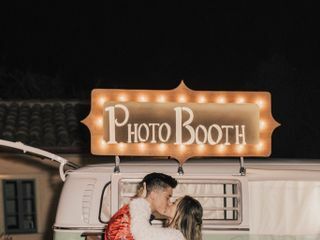 Between the location at Rancho Dos Pueblos mixed with all the fun entertainment - hula & fire dancers, the band, & your incredible singing - it was a wedding to remember. We were thrilled to be a part of it. Thank you for having us! My husband and I couldn't be any happier with our experience! The camera bus was a huge hit and our guests had so much fun taking photos. 805 Camera Bus was nicer than any VW photobooth bus I've seen and came with extra goodies such as props, lights, and personalized print outs. Janelle was great at keeping in communication and made sure to make the day extra special. If you are thinking of getting a photobooth, I highly recommend you choosing them! Thank you for your amazing review, Christine! It means to much to us that we met your expectations! We loved working with you - your wedding day was perfect and your guests were so much fun! We especially loved your personal logo with the hand-drawn VW Bus! Such a nice touch. We hope you are enjoying married life! We loved having the 805 Camera Bus at our wedding! It was also a really big hit with our guests. Their team was great to work with and made the process stress-free. I’m really pleased that we were able to design our own photostrips and we received the online gallery of everyone’s photos in the bus! Thank you so much for the amazing review, Syeira & Elijah! I still can't get over how beautiful your wedding was. Kestrel Park was a dream venue! Your guests were so much fun. Thank you for including us on your very special day! I can not say enough good things about the 805 Camera Bus...working with Janelle was so easy and fun! She was beyond professional and quick to respond! Now comes the day of the wedding and I could not stop hearing all the good raves from my guests about how wonderful and fun this bus was. It is worth every penny!!! The props were amazing! Thanks a bunch Janelle! Ali & Gerry, thank you so much for your kind words and glowing review. You were a pleasure to work with! Thanks again for including us in your special day. Your wedding was absolutely beautiful - and your guests were so much fun! We were honored to be a part of your day. We loved using the 805 camera bus! The pictures came out great. Our guests truly enjoyed having the photobooth with all the fun props! The pictures printed fast and we loved that there is an online gallery for us to look through after. I would highly recommend them for any event! They were great to work with responsive and kind. Maegan & James, you were a dream to work with! Your wedding was so much fun and we had a great time interacting with your guests. We are thrilled you loved your photo gallery! Looking back at those memories is always a blast. Thank you for having us! We were honored to be included. 805 Camera Bus was the perfect addition to our special day! 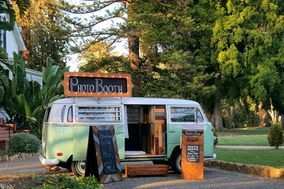 The VW bus is absolutely charming and fit in with the vintage yet classic design of our Wedding and Venue. Everyone was courteous and professional. Our guests had a great time with the photo both including the kids!! Lots of laughs. I would highly recommend 805 Camera Bus for any wedding or event. We appreciate you sharing your experience with us and for including us in your special day! We had such a blast at your wedding. Rancho San Antonio was such a great venue! Thank you for having us! The photo bus was a HUGE hit at our wedding and made our day very special. Everyone raved about how cute and fun it made the day. Janelle and her team were so professional and created a magical experience. Thank you so much for your kind words, Kamele! Your wedding was so beautiful and your guests were so much fun. We were happy to share in your special day! Lori, we were so honored to be included in Jack & Jenny's special day! You really turned a stressful situation into an amazing reception for your daughter and son-in-law. We were grateful to bring an extra dose of joy to the already joyous occasion. Thank you for having us! Adding the 805 Camera Bus to our wedding weekend was one of the best choices my wife and I made. Josh and Janelle Caballero were ultra-responsive to our every request, including last minute changes, and provided an outstanding service. The bus was a hit, and we will certainly have it future events. Aaron & Annie - thank you so much for having us at your beautiful wedding! The location was perfect, and your guests were so much fun! We were thrilled to be included on your special day! We had already booked a package deal with our DJ to have the standard photobooth at our wedding. We were okay with that decision until we went to a local beer festival and had our pictures taken in the 805 Camera Bus. It was such an awesome set up, so many props, and so much fun. When we got out of it, my husband and I turned to each other and said that we HAD to have this at our wedding. 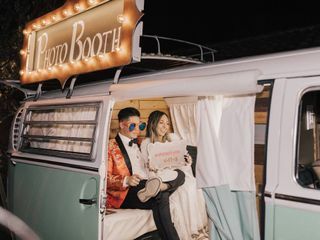 We spoke with Janelle (who is so responsive and helpful) about our situation, and after working with our DJ to back out of the old photobooth deal, were able to book the Camera Bus. With our guests coming to CA from all over, we wanted them see and experience some of that cool California vibe. From meeting Janelle at the beer festival, working with her throughout the entire process, to then seeing it up and running at our wedding - it was worth every penny. Janelle created a custom design for the prints which incorporated our wedding hashtag and they turned out perfect! Our guests LOVED it and thought the bus was the coolest thing - there were always people in there taking pictures. Even when our friends started to get a little rowdy, the Camera Bus team was so polite, and patient (THANK YOU!). It helped make the perfect day, and I'm so happy we traded in our conventional photobooth for this awesome experience! If you want to add something a little different to you event that will be super fun for your guests, GET THE BUS! It was a huge hit at our wedding! We had such a blast at your wedding, Jennifer! Your wedding was so much fun - and so original! We're honored that you went through so much to have us there! We were thrilled to be included. All the best! Guests are still talking about how much they loved the 805 Camera Bus. It is so unique that it is a photo op in itself, AND the quality of pictures is amazing as well. Would recommend this to anyone in the 805 area! Thank you guys! Jessica & David, your wedding at McCormick Ranch was so beautiful! We loved being a part of your very special day. You and your guests were so much fun! Thank you so much for including us. Couldn't be happier! We loved having the bus as part of the wedding day and the bus captured so many photos that we will treasure for a lifetime. So great to work with from start to finish and the guests couldn't stop raving about how much they loved it in there! Highly recommend the 805 bus for any event. Thank you, thank you, thank you! Thank you so much for the incredible review, Lauren! We loved working with you and being a part of your beautiful wedding! It was such a special day. We wish you all the best! Loved every part of our experience. The 805 Bus made our night even more amazing. The keepsakes are so special. I highly recommend this vendor! Thanks so much, Shannon! Your wedding was so much fun! We enjoyed being there! We could not be more pleased with 805 Camera Bus! From working with Janelle on logistics, to coordinating our personalized design, to the their work on the day of our wedding, 805 Camera Bus exceeded our expectations. The bus is a perfect way to have your wedding or event stand out. Our guests loved dressing up in the provided costumes and getting their pictures to take home with them. Following the event, Janelle had all of our pictures delivered to our inbox so that we could include them with our thank you notes. We had a fantastic experience with 805 Camera Bus and we could not recommend them enough! Thank you, Eric & Katie for including us on your special day! Your wedding at Quail Ranch was absolutely gorgeous! We were thrilled to be included! Kindest, most flexible vendor. Refereed to many couples. High quality equipment. We cannot thank you enough, Justine & Connor for including us on your wedding day! You and your guests were so much fun to work with! Thank you so much for your amazing review, Edgar & Chika! Your wedding was absolutely beautiful on the bluffs of Carpinteria! We were so thrilled to be a part of your special day. We wish you all the best! The 805 Camera Bus absolutely rocked our wedding! Our guests couldn't get enough and it was really great to see all of the amazingly fun photos afterwards. On a day that seems like a whirlwind for my wife and I, it was great to be able to look back and see how much fun our guests had. Not only do I recommend 805 Camera Bus, I INSIST that you hire them for your wedding. We have even started to hire them for my event management company! Thank you, Andres, for the glowing review! Your wedding was absolutely beautiful AND so much fun! We loved sharing it with you.